Christophe Gerbier and his team of hardware and software passionates have been working on bringing click boards to the .NET Micro Framework development platform (NETMF). The result: mikroBUS.NET boards! Niels Jakob Buch from the team calls this a revolution in sophisticated development of flexible hardware, simple as 1-2-3. Users just have to choose their NETMF board of choice, plug in the needed click boards, launch Visual Studio (free for the Express version) and start coding with .NET in C#. Deploying managed code to small devices is simple. 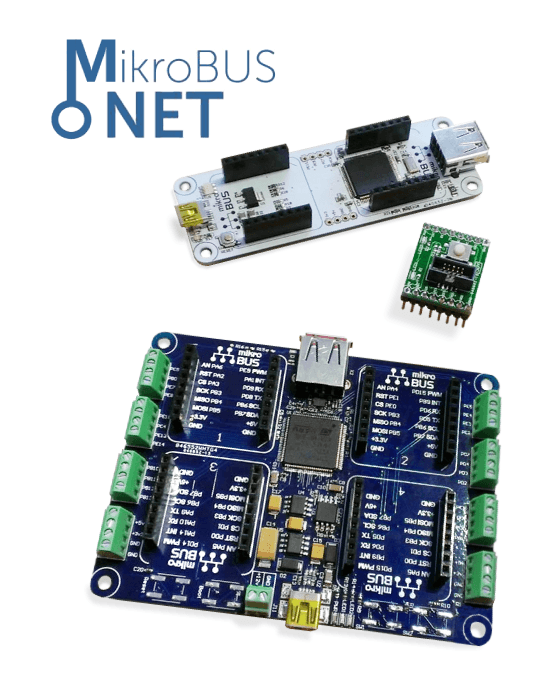 The board runs a brand new firmware based on the .Net Micro Framework 4.3 – and the MBN team wants to express their greatest appreciation to the work done by Oberon MicroSystems on this. Team member Justin Wilson, a seasoned hardware designer, created two boards. They’re not yet in retail but we took a peek at the prototypes: the Dalmatian with 2 mikroBUS™ host sockets, and the Quail which packs 4 slots. Both carry a STM32 ARM Cortex-M4 MCU. The mikroBUS.NET team also designed a Gadgeeter click™ board, for interfacing existing Gadgeteer modules through mikroBUS™. With 70 click boards and 50 Gadgeteer modules, most makers should be covered. On the software side, the mikroBUS.NET team already has .NETMF drivers for 8 click boards, with many more on the way. All are open source, written in C# managed code. Since there are more than 70 click boards to begin with, the mikroBUS.NET team made the coding of drivers easy – also inviting in more people to be a part of this exciting team. There are four templates for Visual Studio for creating them, and it looks easy to get started with. This is exciting development. Just like we brought mikroBUS™ to the Pi community recently, there’s also a community of NETMF fans out there, waiting to discover the convenience and ease-of-use of the mikroBUS™ standard and the accompanying ever-expanding range of click boards. The mikroBUS.NET team is eager to get more people involved, so if you're interested in helping with the project, feel free to send an email to team leader Christophe Gerbier.